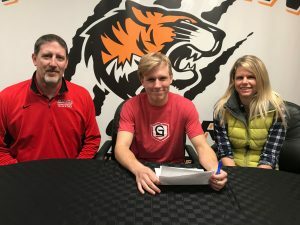 Warsaw Tiger Track & Field standout Hunter Metzger has signed his Letter of Intent to continue his academic and athletic career at Grace College. Metzger, a state finalist for the Tigers in the pole vault last season, has been a leader in the Tiger vaulting program for the past two seasons, and he enters his senior season with hopes to return to Bloomington at the close of his final high school campaign. Metzger, a multi-sport athlete, was also was a member of the Tiger Cross Country program as well. Not only has Metzger cleared bars on the track and field arena, he has set bars in the classroom and the community through outstanding academic achievement as well as through volunteer service. A scholar athlete, Metzger has volunteered with the organizations running a number of local races (running and bike races), he has volunteered his time maintaining local trails in Winona Lake, and he has served organizations providing assistance to Feed My Starving Children. Metzger will vault for the Lancers and coach Jeff Raymond next season. Grace is a member of the NAIA, the NCCAA, and the Crossroads League. PICTURED (L-R): Jeff Raymond, Hunter Metzger, and Shelly Metzger.